SF Giants Minor Leaguer 'Encouraged To Cheat' -How Pervasive, Symptomatic of Team? | Where Did You Go Joe Dimaggio? Home Adderall SF Giants Minor Leaguer ‘Encouraged To Cheat’ -How Pervasive, Symptomatic of Team? On the occasion of the 10th Anniversary of Game of Shadows we visit a related, recent story that went ‘under the radar’ when first out not long ago …. SF Giants Minor League Player Encouraged To Cheat -How Pervasive Is This (if true)? Deflate-gate. Pine tar ‘advantage zone.’ We hear about more and more ways teams and sports figures today may be ‘cheating’ their sports , but none more than, perhaps, this one still ‘under the radar’, that may have been going on for decades – and affecting the results big time, in our opinion,to the tune of three world series victories. Last year (2014) the San Francisco Giants went the first two months of the season with the best record in baseball. Then they went on the worst long losing streak but by then they were still well ahead of the pack thanks to the first two months and turned on the gas in the end, as needed. In 2013 the Giants began the season horribly, after winning the World Series the previous year. No team had ever shown such a disparity from one season to the start of the next, going from first to last place for several months. But then, the Giants, en masse , went on a tear that brought them back to , at least, normalcy, even though they didn’t quite go all the way. This year (2015), the Giants began the season with the worst record during April, only to turn that around with the best record in baseball during May – and starting it well before Hunter Pence came back and without Pablo Sandoval and only one name starting pitcher. As for the post-seasons, when teams normally slow down against top competition, the Giants have managed to ‘go crazy’ all three years. Talk about Ruthian-like numbers, e.g. think Sandoval in 2012 and his three homers in one game against Detroit’s top pitcher and six during the playoffs (after only hitting 12 all year) and near .350 average (same for 2014 after hitting only .287 against lesser pitching . Think Bumgarner last year, going from 20th best ERA in the league to 1st in the post-season. Think Cody Ross in 2012 and his sudden six homers during October after being picked up on waivers. 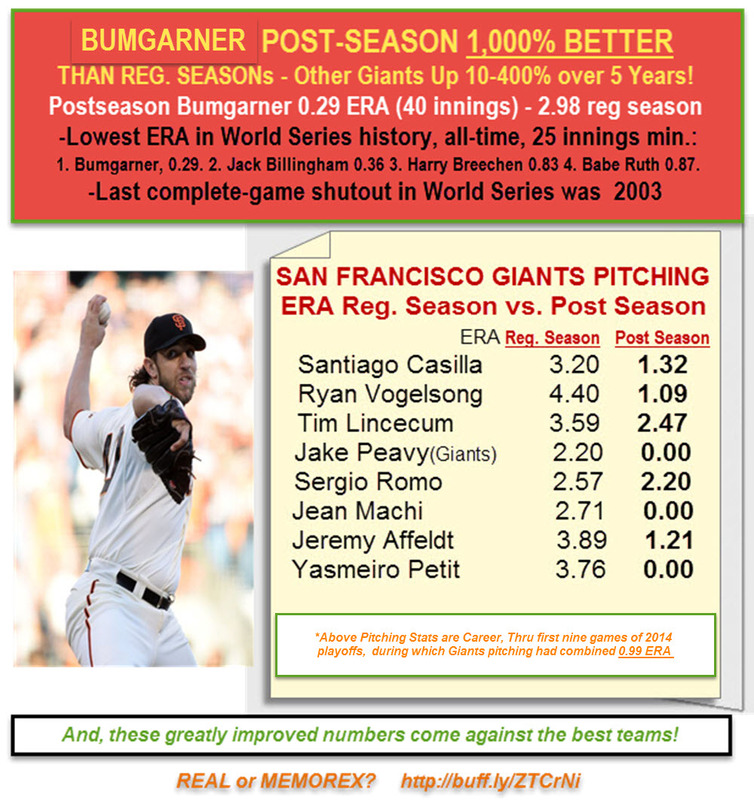 Three World Series running the Giants, as a unit, would perform MUCH BETTER in the playoffs against top pitching than during the regular season; even players previously relegated to ‘Siberia’ like Barry Zito and Tim Lincecum would somehow manage to make large impacts in the playoffs. The pattern continues year after year with the Giants, as a unit, going on not slumps but long, dramatic roller coaster rides, but somehow, managing , since 2010 , to right themselves- and three times enough so to win World Series. What’s especially incredible is that the Giants player names may change but the team continues to win WHEN IT MUST – and they do it with many cast-offs or recent non-spectacular minor league players who suddenly become Ruthian-like when they arrive on the Giants big league team. Pitchers and hitters alike. This year alone, think Peavy, Vogelsong, Casilla, Panik, Duffy. In prior years think Scutaro, Huff, Burel , Torres, Cody Ross. The Giants get criticized for not coming up with many good trades or free agents but they end up winning – and with the most unlikely players. And this year is no exception. If it were but one year call it an anomaly but after five years and three World Series one must look a little closer behind the GIANTs CURTAIN. In recent years, many have wondered how a team like the San Francisco Giants could win three World Series in five years with teams made up largely of cast-off older players and unproven younger ones. We’ve seen time and again an unlikely group of players -in which names may change from year to year – that will perform poorly for long stretches only to suddenly come to life for long stretches in bigger games , as a unit, and somehow get to the next level against better teams. 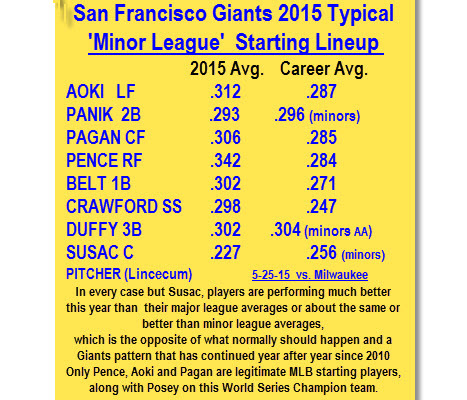 In so doing, with rare exception, players will , overall, perform better with the current team Giants than their career averages or early as well or better than even their minor league averages – all highly unusual stats (as seen in above chart). In post-season play this ‘coincidence’ is even greater (see below). And so, is true for pitching, though we have yet to see the stat comparison for 2015, but note the post season comparison below when it comes to pitching in 2015 (Comparisons are comparable for 2010 and 2012). If only one or two players showed such improvements we could chalk it off to coincidence, but when virtually the entire starting lineup or team show such unlikely change – and especially late season when it counts – one has to ask questions. And, if one has followed the use of PEDs over the years, the expert in the field (none other than Balco’s Victor Conte) has reminded us, among others, that a player can go on the drugs for periods as short as a day and within hours have the drugs not show up in one’s lab. Yet, the performance enhancing effects of the drugs can last for days after one stops taking them; that’s why players will usually go on them for periods of weeks and then come off of them with a still strong ‘carry-over’ affect, as we understand it. In last year’s playoffs the word ‘luck’ was used by many to describe how / why the Giants again snuck by teams much better, on paper, to win its third world series in five years. And, this was with a team with many new ‘no name’ players not on the previous World Series editions. Younger players with names like Panik, Duffy and Susac, with little or no major league experience would come up to the parent club late season to suddenly become unlikely stars and/or late-season heros. Last year he Giants couldn’t buy a second baseball for any amount of money . After going through a half dozen , including a .160 hitting journeyman appropriately named Uggla, they didn’t know what to do. In desperation, they brought up a guy with no major league experience, perhaps also with an appropriate name, Joe Panik, who did anything but… The minor leaguer with virtually NO MAJOR LEAGUE EXPERIENCE would suddenly become a late season star – IN THE BIG LEAGUES against the toughest teams and pitchers, in the playoffs. And this is a capsule of the way things have gone for the Giants, who perhaps should be called the Angels. Year after year, it’s something else, as if heaven sent. While the longest termed General Manager, Brian Sabean, has been criticized for not being able to make the big, successful trades or sign free agents, he’s brought in players with questionable pasts who suddenly perform when they come to the Giants. Whether the new kids on the block or the castoffs – think Scutaro in 2012, Guillen in 2010, Cody Ross 2010– and Panik last year. Meanwhile the rest of the team (often of suspect nature, too – think Huff, Burrell, etc.) also turns it up a notch or two just in time for the playoffs. 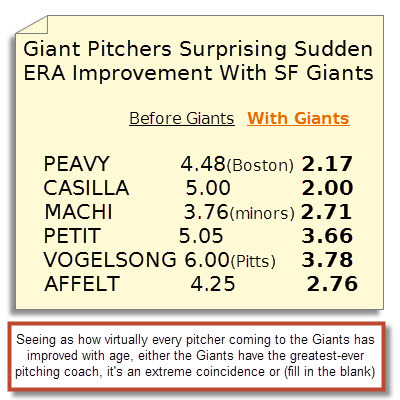 When other teams start underachieving against better competition, the Giants IMPROVE. When other teams feel the August heat and late season doldrums, the Giants are , somehow, turning it up a notch. The names may change from year to year but whoever it is on the Giants seems to get the job done. Hitters’ strikeouts suddenly diminish and pitchers’ velocity and performance improves (e.g. last year Bumgarner went from the 30th best pitcher in the league to first-a 1,000 % improvement improvement – in the post season; much like he did in 2012. Veteran pitchers like Vogelsong and Peavy – who probably wouldn’t have made the starting lineup on any other teams – suddenly became world beaters. In 2012, even ‘the $150 million dollar mistake, ‘ Barry Zito, came to life in the playoffs. And this year, we see a Giants starting lineup that looks more , on paper, like a Triple A (or Double A) than major league team with Panik and Duffy, who is hitting a .300 this year as an every day player, along with Susak and Maxwell filling in regularly . Just last year Duffy wasn’t even playing Triple A ball, yet has beaten out newly acquired ‘$4 million man’ Casey McGee for the third base position. Then you have the Brandon brothers, Crawford and Belt, with near career .250 averages, who when the Giants were in a real tailspin, suddenly have stepped up their averages into the .300s WITH POWER, reminiscent of past years when the pressure was on. The story goes on and on, with example after example, going back to the first World Series year, 2010 – the first time the Giants had won a World Series in nearly 60 years. Yes, in this era of Steroid or PED baseball, the Giants have had more than their share of KNOWN users on the team – at least one each WS year with Andres Torres and Jose Guillen (2010), Melky Cabrera, Gueillermo Mota (2012) and Michael Morse last year. In fact, these players alone may have made the difference between getting into the playoffs and World Series for the Giants. He was 27 and still had never pitched in the big leagues. The 2009 minor league camp for the San Francisco Giants didn’t offer much hope. There seemed no way to boost his flagging strikeout totals. That’s when he got a bit of advice. Broshuis tested a spitball, with eye-opening results. But, he says, he couldn’t bring himself to use it in a game — the pitch is banned, after all. Broshuis soon took up a new line of work — law school. Neither he nor his conscience ever made it to the majors. But his time in the minors was not an entire loss. He wrote a paper on cheating in baseball while at the Saint Louis University School of Law, and it’s been floating around the Internet. The paper adds to a debate about bending the rules, a practice that may be as old as the game itself. And it gives readers a chance to learn a few of the sport’s darker arts. We’ve asked before and we must ask again if the above episode is a one-off or an incident that has repeated itself throughout the Giants system, minor through major leagues – and now perhaps in other organizations? If there’s smoke there’s fire. And, if you hear of one coach or player doing something, you have to consider others on the team doing similar, especially when it comes to PEDs and the Giants history of 23 KNOWN PED USERS since Barry Bonds in the 2000s. A team like the Giants that would allow a known cheater (Bonds) – Bonds admitted to using ‘clear and the cream’ – to come back to coach, albeit spring training , and continue to be rewarded must be questioned; if nothing else it looks bad, but not in San Francisco it appears. We are again asking questions. There may be no REAL ‘smoking gun’ -even Barry Bonds got off his charges, yet everyone KNEW – yet in today’s game of baseball where PEDs DO MAKE A DIFFERENCE much moreso than in other major sports where POWER isn’t as critical – we ask these questions about which others , especially in psyhophantic San Francisco, seem to turn away from ,never consider, or even notice OR CARE . It took two brave SF Chronicle NON-SPORTS reporters to finally uncover the Bonds PED travesty in which a thirty-something, obviously bloated player was hitting homeruns at Ruthian rate . Yet even after Bonds-who had never hit over 36 homeruns until he came to the Giants- broke majestic homerun record of Ruth and passed his Godfather, Willie Mays, did anyone in San Francisco seem to question the feat until these two reporters, Lance Williams and Mark Fenaru-wada (now bounced from the Chronicle) came along. Somehow, in baseball- and especially in more liberal media-friendly cities like San Francisco- people don’t seem to care much. Have we come to the point in society where drugs and cheating is just now part of the fabric of sports and life in general? As we see marijuana becoming legal in States, are we also seeing a new generation of fans – as well as some left over from the ‘flower power’ days – just accepting PEDs in baseball now? A full three decades since San Diego Padre Ken Caminiti – then coached by none other than Giants current manager Bruce Bochy– are PEDs here to stay? Major League Baseball is as schizophrenic as ever, on one hand telling us that PEDs have been cleaned up but on another hand giving permission to 10% of players to use the PED Adderall and allowing former KNOWN users to continue playing after one and two convictions. Perhaps PEDs have ‘saved’ baseball, allowing for bigger power numbers, and MLB doesn’t want to bite the hand that feeds it , except in appearances. The Mitchell Report, though oft criticized, was actually a good thing, exposing players who used PEDs through 1987, or thereabouts, while putting others on guard. Yet, since then we’ve seen another whole new ‘cartel’ of drugs in baseball with different names and associated players – as evidenced in the 2013 Biogenesis Lab scandal – where 20 major league players were found out to have been using PEDs. Without the scandal, former commission Bud Selig could have gotten away with claiming baseball ‘clean’ as his own testing has only caught a handful of major leaguers in the following years. Perhaps it’s high time for another Mitchell Report, but doubt that will ever happen . Now, this year, we’ve seen four new PED indictments the first week of the season – and this time for an older PED that was thought to be eradicated long ago from baseball. And with the league ALLOWING 10% of players the use of ADDERALL, the drug supposedly used to help players’ Attention Deficit Disorder – there would appear to be a continued ‘problem’ (or is it anymore?) , and most likely in San Francisco where it all began with Bonds and Balco many years ago. If you can believe Balco’s own Victor Conte, ‘up to 50% ‘ of players are still using PEDs – and who would know better? So, the Giants, who weren’t going anywhere until 2010 -56 years without winning a World Series,even with Bonds and his ‘merry men’ Williams, Aurilia and company- at least discovered through Bonds’ presence a ‘back door’ to the World Series – which is now working . Perhaps other teams don’t further question the Giants’s success because they’ve become complicit themselves with PED users of their own, though probably in much smaller numbers. And, so it goes, in our opinion. Watch the Giants streaky pattern the rest of the season, how they will win as needed. Perhaps when drug tests are announced , note a drop off and, later, if they get too far behind, another sudden surge. The only thing that will explain that, well- let’s put it this way… The first month-plus of the season the most runs the Giants scored in a game was six. Since May 10 the Giants have AVERAGED OVER 6 RUNS A GAME. In their latest road trip they scored 37 runs in 6 games. Incredible for a team not known for hitting that couldn’t score more than six runs in a game all season! And, that’s even before Hunter Pence came back they were getting hot. And, that’s without Sandoval or even Casey McGee, just with what we call the ‘Minor League Giants,’ including three-five starting players who probably wouldn’t start for any other major league teams, that is, until now – with a little help, if you will ( in our opinion). In last night’s game against Milwaukee, Brandon Belt hit a ball higher, and perhaps longer , by 25 feet, according to Giant announcer Jon Miller, than anybody’s hit a ball all season. So, you’ve got Giants players who couldn’t hit a lick for a month suddenly ALL hitting for average and power. All players in the starting lineup are hitting near or above .300 and the Brandons are suddenly hitting homeruns like they’re going out of style. Crawford, not known as a homerun hitter , already has six. Even in the minor leagues he never hit more than seven in a year and already has six. All players are hitting above their career averages (excluding the ‘minor league guys’ who are still doing as well IN THE MAJORS as they were in the minors! We’ll say the politically-incorrect thing here but it just seems like Giants players are getting some help somewhere. For them, as a group to turn it off and on at will, time and again, just seems too coincidental. Just watch the team… doubtful it will go on all season, i.e. notice a mass drop-off at some point when , perhaps, drug testing is announced (they give players warning, you know, to clear their systems) and batting averages and pitching numbers will drop back down to those of the average /minor-league numbers they SHOULD be hitting and pitching. Not that players on other teams are doing similar things as the Giants, but San Francisco is where #PED use really got boing over twenty years ago with Bonds – and thereby spread to other teams, where it hasn’t stopped since. Only some of the drugs and players names have changed, in our opinion. We miss REAL baseball, when you KNEW a homerun WAS a homerun and you didn’t have to question whether a player might be getting some help. But, then again, in a society that rewards the Kim Kardashians and Bruce Jenners for artificially enhancing themselves, now we have baseball team after team that will continue to sign the Nelson Cruz’s and Bartolo Calon’ s of the world for more money than they ever got before they were known to have used PEDs. And now, thirty years later, you have a whole new generation that only knows baseball in it’s PED state and thereby has no real comparison to question it. 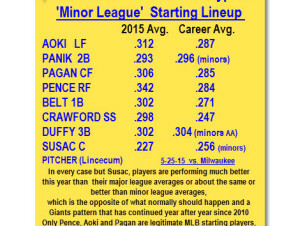 , Which looks as if PEDs are here to stay, sadly, in our opinion. So, the players using PEDs continue to get away with more fame and fortune in a sport where PEDs MAKE A REAL DIFFERENCE -and the legit players can’t always stack up as high next to their enhanced counterparts. The latter aren’t regarded or paid their fair share and some may no longer even be able to make the team , like Garrett Boshius, who didn’t want to submit to using PEDs. Boshius is one of few to have come out against cheating in baseball, as well as his current crusade, to help the minor league player. of which he was one, reach salary parity with major leaguers. Much like politics and seemingly everything else today, there are two sides-a good, honest one and a bad, dishonest one. Sadly the bad, dishonest one seems to have become pervasive and may be winning throughout society now. Say it isn’t so , Joe.